Christmas at Wheel’s family farm included candy. I zeroed in on the Peanut Butter Chocolate Bars Grandma made. The peanut butter cup knockoff. Tastes just like the cups in the bright orange wrapper — aka Reese’s Peanut Butter Cups! Sweet peanut butter wrapped in chocolate — bliss! This is a very simple recipe – four ingredients counting the secret and unexpected one. It’s faster to make with a food processor and the microwave, but easily done by hand. I cut the recipe in half to make 32 pieces in an 8×8 pan instead of the 48 pieces Grandma made in a 9x 13. Line the 8×8 pan with non-stick aluminum foil, parchment or wax paper leaving a 3 inch overhang on each end to make “handles” so you can lift the candy out of the pan for slicing without losing a single piece. The bottom layer of chocolate is optional. I omit it unless I am making this for a gift or a party. The candy is pretty rich so slice it into one inch by 2 inch bars – or even 1 inch squares fancied up in paper candy cups. I’ve always thought this would be pretty at Christmas time with a little drizzle of red or green, but it never lasts long enough to try that! Oh – the secret ingredient? Graham cracker crumbs give it body and texture. Just like the candy in the bright orange wrapper! 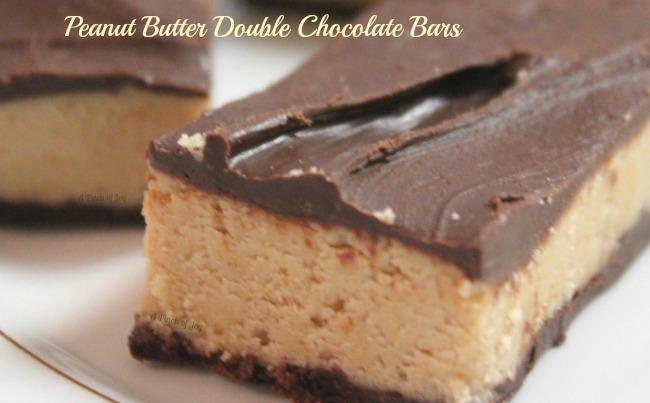 Chocolate and a fabulous peanut butter mixture that tastes just like Reese Peanut Butter Cups. Quick and easy to make. Make chocolate bottom -- optional. Melt ¾ cup chocolate chips in microwave 40 seconds on high and then in 20 second intervals until chips become soft and begin to lose shape. Stir smooth. Spread in waxed paper lined 8 x 8 pan and place in refrigerator to harden. You can do this step ahead of time, even a day or more in advance. Make graham cracker crumbs, if using whole crackers, by pulsing in food processor until fine OR using rolling pin to crush. Melt butter 30 seconds in microwave, 10 second bursts until loses shape and add to graham cracker crumbs, Pulse in with two 10 second bursts. OR stir in well. Add peanut butter and pulse once for 10 seconds OR mix in well. Add 1 cup powdered sugar and pulse OR stir until well mixed. Add ¾ cup powdered sugar and mix well again. Mixture will form a soft but defined. slightly dry looking ball. Add peanut butter mixture to 8x8 pan and press down into even layer. Make chocolate topping. Melt ¾ cup chocolate chips and in microwave 40 seconds on high and then in 20 second intervals until chips become soft and lose their shape. 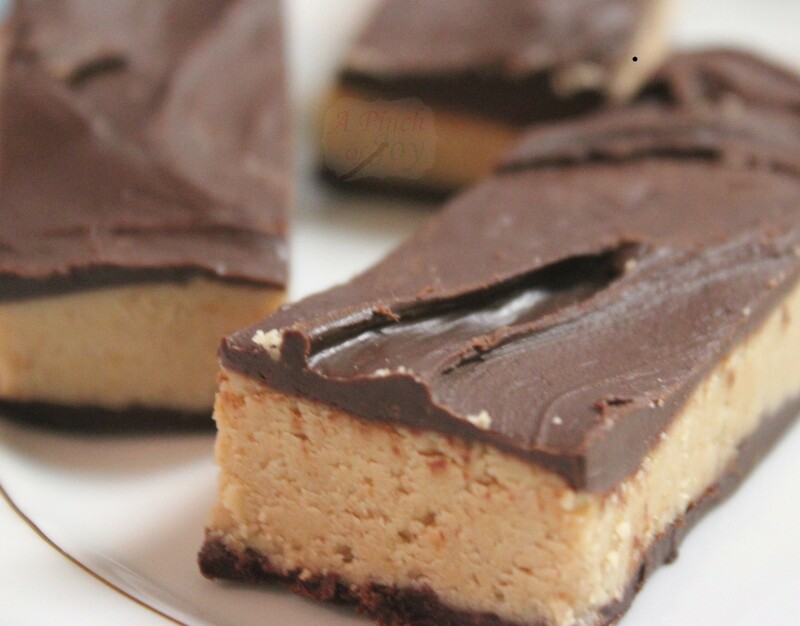 Spread over peanut butter bars. Refrigerate for 1-2 hours until firm. Let set at room temperature for a few moments before cutting so chocolate will slice without breaking. Cut into 1 x 2 inch bars to place on plate or 1 inch squares, if using paper candy cups. Oh my, my mouth started watering as soon as the page loaded and I saw that first picture. These look absolutely delicious! Thanks for letting me know and especially for the double link up! I am honored and delighted! wow my very favorite flavors ever!! These look delicious. I was enjoying some peanut butter brownies yesterday. Chocolate and peanut butter are wonderful together. Thanks for sharing on Sweet Indulgences Sunday. You had me at “no bake” LOL….Yummy! These look sooo YUMMY!! Will definitely be making come baking day 🙂 Thanks for sharing! !